Address: Madras Veterinary College, Vepery, Chennai-600 007. 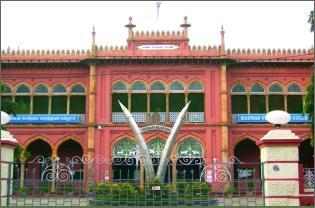 The Madras Veterinary College is a veterinary college situated in Vepery, Chennai, India. The college was established on 1 October 1903 in a small building known as Doblin Hall. The college became affiliated with the University of Madras in 1936 and became the first college to offer the bachelor's degree in Veterinary Medicine in India. In 1989, the first veterinary university in India, Tamil Nadu Veterinary and Animal Sciences University (TANUVAS), was formed, and the college became affiliated with it.